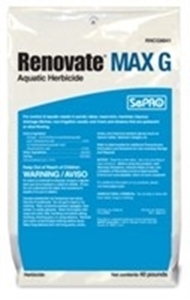 Renovate MAX G is formulated on an exclusive biodegradable granule to deliver targeted control, improved results and value for selective and systemic control of broadleaf aquatic weeds. Renovate Max G (granular) Aquatic Herbicide, technology and innovation for selective and systemic control of broadleaf aquatic weeds. A first for aquatic plant managers, SePRO has developed and formulated the first combination herbicide registered in aquatics with proven synergy in one powerful formulation.